Huh? Tune my antenna SWR? I didn't know I even needed to do that! What's SWR? I can hear you saying this already. In order to explain why you need to tune your antenna, I first have to go into a bit of radio frequency theory, which in itself requires a bit of physics. When you transmit on your CB, you become a miniature, mobile radio station. This means your transmitter is sending an electrical signal down your antenna. This signal is vibrating at a specific frequency, varying from 26.965 MHz (channel 1) to 27.405 MHz (channel 40) - with a channel spacing of 0.01 MHz per CB channel (this means add 0.01 MHz to 26.965 MHz to get channel 2's frequency, add 0.01 MHz to that to get channel 3's frequency, and so on). The transmitter modulates an electrical voltage at the frequency appropriate for the channel on which we want to broadcast. This modulated voltage is called the carrier, because it carries the audio signal. This modulation is a sine wave - which basically means the voltage goes smoothly from zero, to positive, back to zero, to negative, and then back to zero again. It does this millions of times a second (26.965 million times per second to be exact, for CB channel 1), and the result is a wave of electrical energy - much like a wave you'd see on the water, except we're sending waves of electrons instead of waves of water molecules. The power amplifier (or "final") in the transmitter sends out the carrier wave as electrical energy. It travels down the coax wire to the antenna, up the length of the antenna, to the tip. During the wave's trip to the tip of the antenna, some of its energy is emitted from the antenna as RF (Radio Frequency) energy. This is your transmitted signal that other people can receive on their CB radio. Once the wave hits the tip, it has nowhere to go - so it is reflected back toward the radio. This is where it gets interesting. The reflected wave and the transmitted wave are occupying the same piece of metal - so they are summed, or added together. If the reflected wave is out of phase with the transmitted wave (meaning the reflected wave's positive cycle is at the same place as the transmitted wave's negative cycle) the resulting sum is ZERO - which means the effective amount of available energy is zero. This means two things: one, no energy is being emitted from the antenna as RF, and two, all the energy being modulated by the transmitter's power amplifier is converted to heat...quickly destroying your power amplifer. In practice, there are safeguards to prevent this from happening. On the other hand, if the transmitted wave and the reflected wave are in phase, the summed result is twice the original amount. This means more power to emit as RF, and more effective radiated power. In reality, the result is never twice the original amount, but an in-phase signal is a good thing. When these waves are in phase, we get what is called a standing wave. The more power we can get radiating out from the antenna, the farther our signal will reach. So it's in our best interest to do whatever we can to get as much power as we can from the transmitter out to the antenna and into the air. This means we want standing waves. There's two ways of creating standing waves: alter the frequency to match the resonant frequency of the system (i.e. antenna) the waves are being injected into, or alter the resonant frequency of the system. In our case, we the frequencies are predefined, so we can't really alter them. So instead we alter the resonant frequency. In the water tank example above, they alter the resonant frequency by altering the length of the water tank. In our antenna system, we alter the resonant frequency by altering the length of the antenna mast itself. Radio and TV stations have the luxury of transmitting on a single frequency, so they can tune their antenna systems for maximum efficiency at that one frequency. We don't have that luxury, so we have to compromise. The best compromise is to tune your antenna to work best at a median frequency - and in our case, that happens to be channel 19. Ever wonder why truck drivers occupy channel 19? It's not a coincidence. This means as we move away from channel 19, the efficiency and radiated power will decrease, as will your transmitting range. Of course, if you primarily use channel 7 (for example) for all of your communications, feel free to tune your antenna for maximum efficiency on channel 7 instead. That's the end of the physics lesson. On to the practical part! Before starting, you will want to move your motorcycle outside, away from structures and vehicles. Any large object that will reflect radio waves (i.e. anything with metal in it) will affect your measurements. Moving your motorcycle out to the bottom of your driveway will normally be sufficient - but if you can find an empty parking lot somewhere, that's even better! 1. To measure the standing waves in your antenna, you will need an SWR (Standing Wave Ratio) meter. This meter typically has two displays: a "foward power" meter, which is the amount of RF signal being transmitted by the transmitter, measured in watts, and an SWR meter, which measures the ratio of transmitted power to reflected power. The lower the ratio, the better - and anything above 3 is potentially harmful to your transmitter. 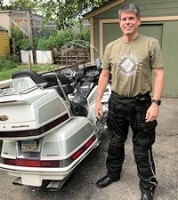 The meter shown in the picture was purchased online from Sierra Electronics, an excellent motorcycle electronics store. 2. SWR meters typically have PL259 screw connectors, which is just fine for standard automotive CB's and antennas. 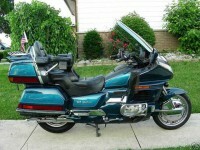 However, Goldwings use standard AM/FM automotive Motorola connectors for the CB. 3. For this reason, you will need a set of adapter cables such as these that adapt the PL259 connector to a Motorola connector. IMPORTANT: Ensure that the MALE Motorola connector is connected to the INPUT side of the SWR meter! 4. Begin by removing the left lower cowl cover to access the antenna pigtails. 5. Disconnect the antenna pigtails from one another, and plug the ends of the meter leads into the pigtails. 6. With the wires connected, rest the meter on a secure spot (the valve covers/crash bars work well for this) where the meters are easily visible. 7. Switch the ignition to ACC and turn the CB on. You don't need to turn the volume up or connect a microphone - we will be transmitting a blank carrier (no voice signal) while doing this test. 8. Check the transmit and channel change buttons to ensure they're working correctly. 9. Switch the CB to channel 19. 10. On the SWR meter, set the control switch to "SET". 11. You will see a small adjustment knob on the SWR meter. We will calibrate the meter using this knob. 12. Key the transmit button on the CB, and while holding it down, turn the adjustment knob on the SWR meter so that the SWR meter shows "Set" or "Infinity", as shown. 13. Release the transmit button on the CB, and switch the meter from "SET" to "SWR". 14. Key the transmit button again, and observe the SWR meter. Take a note of the reading. 15. While transmitting, you can check the "forward power" (amount of power being output by the transmitter) in watts on the power meter. 16. The SWR meter should not show more than 3, as shown here. Having an SWR more than 3 can damage your transmitter. Most antennas are sold new with overlong masts, to allow for adjustment. These overlong masts can cause SWR readings in excess of 3, as was the case in this picture. 17. Turn the ignition off, and loosen the set screws in the antenna load coil holding the antenna mast in place. Remove the antenna mast. 18. The antenna mast needs to be shortened - however, very tiny changes in the antenna mast length can make very large adjustments in your SWR reading. I use a grinder wheel for this, but a file will work just as well. Using a black marker, mark approximately 1mm on the end of the mast, then remove that 1 mm of mast metal. 19. Reinsert the mast into the load coil, and re-tighten the set screws. 20. Turn the CB back on, and repeat the measurement process from step 12 onwards. As you shorten the mast, the SWR reading will decrease. 21. After the reading has decreased, loosen the mast and move it slightly out of the load coil before retightening it again - effectively making it a bit longer. Check to ensure that the SWR reading increases. This ensures that you're still going in the right direction. If you make the mast too short, the SWR reading will begin to increase again. At that point, there's nothing you can do - you can't make the mast longer again! This is why you should take only very small amounts off at a time. 22. Eventually, you will get a reading that is very low. Ideally, you could get a SWR reading of 1 - although on a motorcycle, this is going to be very tough to do. This will ensure the maximum possible output for your CB. 23. Disconnect the meter, and plug the antenna pigtails into one another again. 24. Replace the lower cowl. If SWR on channel 1 is higher than it is channel 40, your antenna system is likely too short. Your antenna mast length may need to be increased. If the SWR on channel 40 is greater than that on channel 1, your antenna is likely too long, and reducing the mast length will need to be done. If SWR is in the "red zone" on all channels, you probably have an electrical short in your coax connectors, or your mounting stud was installed incorrectly and is shorted. Do not operate your radio until the problem is found, serious damage can occur to your radio. Very complete writeup GS, thanks you. I hope that you have loosened the socket headed set screw that holds the upper mast in place. If not, then loosen the set screw or maybe even take it all the way out. Then put some penetrating oil in the set screw hole and let it set for several minutes. Then wrap the aluminum top of the load coil with a rag or even a leather belt or something suitable to prevent marring of the aluminum. Grip that top with a pair of piers. Grip the mast with a pair of vise grips. Twist in opposite directions. Do not allow the load coil halves to twist. It will destroy the load coil. Coil and mast should separate. Your link, if that is what it is, didn't work. But, I'd like to say that if there is something that you know nothing about, perhaps you should leave it for someone that does know something about it. I suggest that you get someone in your group of friends to give you a hand. It will prevent damage to your equipment and possibly prevent injury. Thanks for the input MikeB yes I took the set screw all the way out before I started and Have been using vicegrips and pliers I guess I will get some penetrating oil that should work better than w-d 40. Thanks again. They all work very well. Ask me how I know.